I was very recently talking to some friends of mine. You know, the best and most engaging talks with friends, sometimes come at the most awkward times but yea, aha moments are not far-fetched in those moments. the Internet about how there wouldn’t be any values left to teach kids, or to pass on to future generations; that with the rate the world is going, we would get to a point where there wouldn’t be anything as being ‘morally sound’. This theme elicited some argument. It is obvious that the world isn’t the way it used to be. Many things that were frowned at years ago are now permissible. Behaviours, dressing and attitudes are now retreating like the shoreline in a river bank. Unfortunately, these things are getting worse by the day and, as my friend posited, we are galloping towards a world where ‘wrong’ will be indefinable; a terrible and chaotic world that should remain only in our imaginations. Another friend, however, put forward an argument that he was sure the world wouldn’t reach to that level. He claims that a drastic and sudden change will occur at some point in time to restore balance to the world. He cited the biblical case of the world of Noah as evidence to buttress the fact, that the world revolves in a cycle; when evil overtly overwhelms good, something springs up and wipe this imbalance, before the world begins another cyclical movement. He, however, added a caveat in the example he cited; since God promised never to destroy the world again by flood, then it is unlikely that something of that magnitude or nature may occur. Nonetheless, the point he makes is that a force, revolution perhaps, will definitely tilt the balance back. So what do I say? ‘He that is righteous, let him remain righteous’. In this rapidly-changing fickle mindless materialistic world, good can only remain when those who want to preserve good continue to do good. Technology wouldn’t solve the world’s ethical and moral problems. This is why, despite the advancement of our knowings, the depth of our depravity stinks to the heavens. Acquisitions wouldn’t also solve it either in this transient world. To what then do we look up to? Minds. Rightly convinced. Following the eternal principles that keep the world intact. 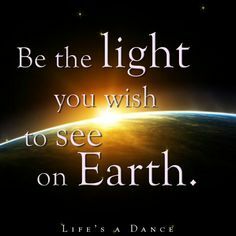 In the end, it all boils down to, ‘Be the light you wish to see in the world’. Thanks for dropping by. I agree with the essence of your submission. However, while i agree that definitely things will change, and many things have to change, I do not agree that most things should change, even if they doing so now. Don’t you think that my aspects of morality are not relative?